The history of writer Olugbemisola Rhuday-Perkovich alone had me hooked: Nigerian father, Jamaican mother, married to a man of Croatian descent, she studied writing with Paula Danziger and Madeleine L’Engle. The book—8th Grade Super Zero—was good too, not blowing me away, but offering a solid story of a struggling teen that felt very real and didn’t shy away from real issues. Reggie, the main character, is dealing with his father’s unemployment, his church youth group is a major influence on his life and he starts going to a homeless shelter as a one-time project and it becomes something so much more. Reggie is this dorky, outcast kid who isn’t always perfect but finds a way to struggle through and make the right choices. The faith elements were simple and understated—Reggie went to church and was a part of his youth group, where he engaged with questions about God. It wasn’t preachy it was just part of his life. That kind of straight-forward talk of religion is rare in a YA book, but it seems like it’s becoming more common. It’s also rare to see homelessness treated with such dignity and reality in a work of fiction. Reggie’s project reminds me of the work of Mark Horvath with InvisiblePeople.tv, though as Reggie gets to know the people at the shelter, he starts to see them as people and realizes the greater work he can do. In addition, the book explores the usual teen/YA topics of popularity, fitting in, changing relationships, girls and even race. 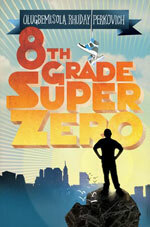 It’s hard for a book to cover so much territory and still remain focused, and 8th Grade Super Zero succeeds.